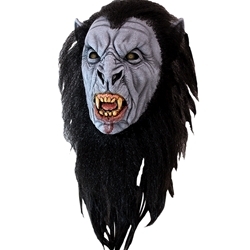 The Dracula Wolf Mask is an officially licensed mask from Bram Stoker’s Dracula. This is a full head mask with attached hair. The mask is grey and features detailed wrinkling across the face, and a sneering open mouth with blood. In Bram Stoker’s Dracula, Dracula takes on the shape of a wolf when roaming London. Don the Dracula Wolf Mask this Halloween, and sate your thirst for blood!